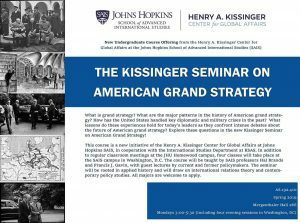 The Kissinger Seminar on American Grand Strategy is a new undergraduate course offering from the Henry A. Kissinger Center for Global Affairs at the Johns Hopkins School of Advanced International Studies (SAIS). What is grand strategy? What are the major patterns in the history of American grand strategy? How has the United States handled key diplomatic and military crises in the past? What lessons do these experiences hold for today’s leaders as they confront intense debates about the future of American grand strategy? Explore these questions in the new Kissinger Seminar on American Grand Strategy! This course is a new initiative of the Henry A. Kissinger Center for Global Affairs at Johns Hopkins SAIS, meant to link SAIS with the undergraduate International Studies major at Homewood. It will expose exceptional undergraduate students to the study of grand strategy and the history of U.S. foreign policy. The bulk of the course will explore critical moments, themes, and people in the history of American grand strategy, from Washington’s Farewell Address to the statecraft of Donald Trump. The seminar will be rooted in applied history—the study of the past as a way of better understanding the challenges and opportunities of the present and future. It will also be interdisciplinary, drawing on international relations theory and contemporary policy studies. The seminar will equip students to evaluate and contribute to intense debates about the future of American grand strategy. In addition to regular classroom meetings at the Homewood campus, the course will feature events at the SAIS campus in Washington, DC, including meetings with current and former policymakers. These sessions will take place on February 11, March 4, April 1, and April 30. Transportation between Homewood campus and SAIS will be provided. These sessions will be followed by a dinner hosted by the Kissinger Center.